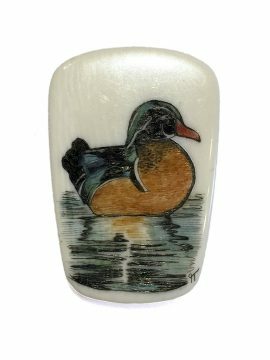 “Native American Matriarch” color scrimshaw on ancient walrus tusk ivory artifact by Gary Williams. Strong depiction of a strong woman by scrimshander, Williams. The entire working surface has been utilized by the artist. Excellent detail in the jacket. Not sure how the ivory was used, but bears marks of ancient people using it as a tool. Great work at a reasonable price, this one is a keeper.